In the course of the Cretaceous a major change appeared: the flowering plants were there! In the very early Cretaceous everything still seemed the same, but roughly 110 million years ago suddenly the angiosperms occurred. And from that moment on they became more and more important and they began to push back the gymnosperms. It is still not clear where they came into existance. 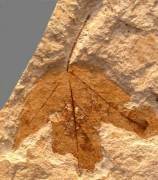 The oldest fossil flowering plant (till now) has recently been found in China and it is about 125 million years old. Click on the upper part of the photo to see more of this fossil and on the lower part to see an enlargement of the photo. DNA research however indicates an origin during the Permian, consequently far, far back. Seemingly these angiosperms have existed in a very modest way, for there is no clear fossil evidence from the Jurassic or the Triassic. There is a similarity with the (hidden) life of the mammals during the dominance of the dinosaurs. The angiosperms were evidently more successful than the gymnosperms. The cause is probably the more efficient way of propagation, but also the different structure of the tissues. A kind of deal was made with the insects (and some mammals and birds) for the reproduction: the latter offered their help for the fertilization in exchange for food. A consequence of this development was the rise of colours and shapes in flowers. Fossils of angiosperms in the Cretaceous are still rather rare, but they occur for exemple in the German Harz region (click at the photo on the right). In most cases they are leaves of trees and shrubs. Herbal plants are much less likely to fossilize. And flowers have nearly no chance at all. Magnolias are said to be very early flowering plants. They have flowers with a primitive structure. But yet there is discussion about this, because research on DNA points in a different direction. Other early angiosperms include the walnut tree, the laurel tree and the water lily. The flowering plants came without too many scratches through the great extinction at the end of the Cretaceous. There are, however, indications that the Earth has been covered with ferns for a certain period (e.g. 100 000 years) before the angiosperms could take over again. Old tertiary angiosperm (and other) plants have been collected in a travertine mountain near Sézanne in France. Travertine is a sinter which is formed when chalky water comes out of a mountain slope. The chalk is precipitated on everything lying around, like plant remains and also dead small animals (when present). In most cases the travertine will decay within a short time, but in de neighbourhood of Sézanne it became silicified and therefore very hard. The fossils of Sézanne are roughly 60 million years old. The leaflets are difficult to identify and there is still not much variation in shape (click photo on the right). The place is famous in France because the oldest vine leaf has been found there (see drawing on the left). During the Eocene large grassy plains came into existence. Grass has the special quality of being more resistant to grazing than other angiosperms. Ancient horses lived in the jungle, but later on new horse species began to set out for more open spaces and they started to eat grass. Probably the large grassy plains developed by co-evolution of grazing animals and grass. This means that there was an interaction between the grazing animals and the grass: the animals ate the grass, the grass became adapted for the sake of survival, the animals adapted in their turn to innovation of the grass, and so on. The cliffs along the coast of the Isle of Sheppey (England) are very unstable: from time to time parts are collapsing (see photo on the left). This is annoying for the inhabitants, but because of this all kinds of fossil plant remains are found on the beach, especially seeds. They are from the Eocene and they are about 50 million years old. These seeds indicate that there was a mangrove forest at that time. Thanks to the fossils it is possible to understand which plants were growing in the woods. In the book The evolution of plants and flowers by B. Thomas (1981) is a fine reconstruction of such an environment. Click here to see it. To study the fossil angiosperms, extensive knowledge of the now living flora is necessary, because the fossils must be compared with their living relatives. That is quite different from fossils of the older plants, which often lack recent relatives. A place where we have collected many angiosperms (and other plants) is St. Maime in the south of France. The strata (photo on the left) are deposited in the Oligocene (30 million years ago) and it is striking how the fossil plants still resemble the living ones. Click on the photo on the right to see a number of them. Also many seeds are found, for these are more resistent than leaves and they had therefore more chance to fossilize. Because the lifespan of a species is 6 million years on average, we may assume that the species we find here, have become extinct. 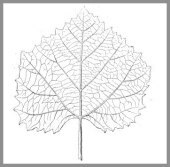 The identification of the fossils is rather difficult, because the main characteristics are the shape of the leaf and the kind of veins in the leaves. And leaves of different trees can resemble each other very much. Think of the birch and the elm: a birch tree bears also elm-like leaves and vice versa. Click here for more information and photos. Somewhat younger are the fossils found in clay sediments near Brunssum in southern Limburg (NL). They are from the Miocene or the Pliocene and roughly 5 - 8 million years old. The plants from this spot resemble their living family members even more. Click on the photo to see some fossils from this finding place. Another place where we have collected from, is St. Bauzile in the Ardèche (Fr). The fossils from this spot are preserved in diatomite and they are very young (Miocene, only 8 million years old!). Diatomite is a very light rock, built up of minute shells of diatoms. There was a lot of vulcanism at the time and that's why the water in the lakes was saturated with silica. It was an ideal environment for silica algae or diatoms, which possess a shell of silica. Plants and animals could fossilize beautifully in the very fine granular mud. I am afraid that collecting there is forbidden now. The plants from this place resemble very closely the recent plants, like the leaves of the sweet chestnut tree, the oak and the aspen. Click the photo on the right to see some of the fossils. Really young fossils can be collected for instance in the travertine of Burgtonna in Thüringen (Germany). This sinter has been formed only 10 000 years ago. It is full of twigs and leaves. There are also fossil stoneworts, green algae with whorls of branches. This is interesting, for the land plants are thought to be descended from such stoneworts about (at least) 500 million years ago. All this young stuff (I mean from the Tertiary, younger than 65 million years) looks very nice and is very suitable for showcases. Personally I prefer the unsightly, ancient little plants from the Silurian and the Lower Devonian. But tastes differ!